Cooke, C. (2018). Compassion fatigue: what it is and how to recover. Presented at American Therapeutic Recreation Association Annual Conference, 2018, Grand Rapids, MI: American Therapeutic Recreation Association. Danny Pettry has been a good-standing member of ATRA since 1999. Pettry is not a hired spokesperson for ATRA. Pettry is not an elected ATRA Board member. Pettry is a Lifetime Member of ATRA who volunteers his time to assist with several ATRA committees. Note: Danny Pettry provided his best efforts in summarizing this session. Danny Pettry’s review, views, and interpretations of this training session might not be the same views of the presenter or ATRA. 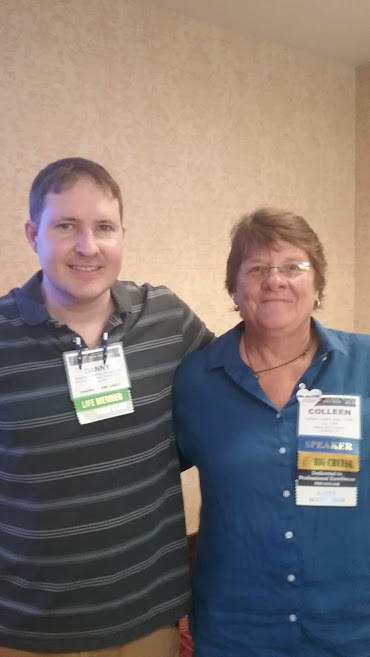 Danny Pettry had the opportunity to attend Colleen Cooke’s presentation on Compassion Fatigue at the 2018 American Therapeutic Recreation Association conference. Pettry provides a summary of some of the key points that Cooke covered. Colleen Cooke, EdD. CTRS, CLL, CHP has been elected to the Board of Directors for the National Council for Therapeutic Recreation Certification (NCTRC), which she currently serves as the Chair. She has previously served on the board of directors for ATRA. Dr. Cooke has been a professor at Slippery Rock University, Slippery Rock, Pennsylvania since 1997. Compassion is defined as being concerned for the suffering of others. A person with compassion is aware of distress in others and has a desire to help alleviate it. Dr. Cooke shared part of a Joan Halifax’s TedTalk about Compassion. Danny Pettry: I thought of the late motivational speaker, Leo Buscaglia while watching the above video. Humanity won’t survive without compassion. How does a person show and experience compassion? People who attended this session suggested: By being empathetic, validating, and vulnerable. Compassion fatigue has been defined as, “the cost for caring for others,” (Figley, 1982). People who work in caring positions (like Recreational Therapists) can experience compassion fatigue. Some symptoms of compassion fatigue can include: loss of hope and burnout associated with the feelings of hopelessness. Some practitioners experience secondary traumatic stress from providing care. Recreational therapists are not immune to compassion fatigue. Danny Pettry’s personal experiences: I’ve worked as a practitioner at a psychiatric setting since 2001. Providing care for people can take a toll. There are many stressors. Staff are trained in providing de-escalation techniques and crisis interventions for patients who become aggressive. Staff providing services in psychiatric settings can be physically attacked and be the target of verbal aggression. Staff at all levels of care can experience vicarious trauma, including: direct care staff, counselor/therapists, educators, and recreational therapists. Danny Pettry: I provide training for direct care staff at the psychiatric hospital/ residential treatment facility where I work. I’m going to share this assessment tool with staff the next time I’m asked to teach about self-care. Danny Pettry: I had taken a photo of the slide provided by Dr. Cooke at her suggestion. However, my photo was too blurry to feature here. Plan to do something about it. Many of the suggestions were “Recreation-based” in nature. Assertiveness: Say ,”No.” Danny Pettry’s thoughts: You might not be able to say “no” to supervisors and administration because they pay your salary. Don’t be insubordinate at work. There are times when people ask for extra favors. Saying yes all the time can take a toll on you. Say no when you’re unable or to manage your own time. Be kind to yourself. Do something nice for yourself. Choose your battles wisely: ask yourself: is this the hill you want to die on? Hang (spend time with) people who support, validate, and encourage you. Radical acceptance: sometimes people close to you might not be available when you need them to be. Danny Pettry: I personally enjoy the taste of coffee. I find the effects soothing. I’m kind to myself by buying myself a cup of coffee ever morning before going to work. For years, I didn’t buy coffee. I thought about saving money. Life is too short. I felt so happy when I started buying coffee every morning. I told myself, you deserve this. Dr. Cooke provided two practice interventions for the attendees of this session. Tapping: This approach consisted of closing eyes and sitting in chair. Deep breathing was suggested. Individuals in this session were instructed to pat the top of their legs to the beat of a drum-like rhythm. This experience was associated with mindfulness practice. Danny Pettry’s personal experience: I’ve taking tapping training with Jack Canfield. Some mental health practitioners teach tapping as a technique to help with mental health needs. I found this exercise to be relaxing and grounding. This is something practitioners can do in a quick 3 to 5 minute timeslot while sitting at desk. I plan to teach this technique to the children and adolescents who I provide services for as well during a weekly mindfulness group session that I teach. Humor: Colleen Cooke is a Certified Humor Professional (CHR). There are many health benefits for laughter. She taught a quick way to increase laughter through the use of the Hawaiian word for saying hello and good-bye, “Aloha.” This approach consisted of waving your hand at someone while saying, “Alo-ha-ha-ha-ha,” in laughing way. Danny Pettry’s personal experience: I felt a bit uncomfortable doing this at first in front of people who I don’t know too well. I didn’t have an authentic laugh at first. However, I found myself laughing at other people who were doing this. My personal plan is to introduce this technique to my co-workers (allied mental health practitioners) as well as to teach it to the patients who I provide services for.